Facebook had 22 Million active users in the middle of 2007; fast forward to 2011 and the site now has 800 Million active users, with 400 million of them logging in every day. Facebook has grown exponentially, to say the least! To cope with this kind of exceptional growth and at the same time offer a reliable and cost effective service requires out of the box thinking. Typical high-end, brute force, ultra redundant software and hardware platforms (for example Oracle RAC databases running on top of a few IBM Power 795 systems) won’t do as they're too complicated, power hungry, and most importantly far too expensive for such extreme scaling. Facebook first focused on thoroughly optimizing their software architecture, which we will cover briefly. The next step was the engineers at Facebook deciding to build their own servers to minimize the power and cost of their server infrastructure. Facebook Engineering then open sourced these designs to the community; you can download the specifications and mechanical CAD designs at the Open Compute site. The Facebook Open Compute server design is ambitious: “The result is a data center full of vanity free servers which is 38% more efficient and 24% less expensive to build and run than other state-of-the-art data centers.” Even better is that Facebook Engineering sent two of these Open Compute servers to our lab for testing, allowing us to see how these servers compare to other solutions in the market. As a competing solution we have an HP DL380 G7 in the lab. Recall from our last server clash that the HP DL380 G7 was one of the most power efficient servers of 2010. 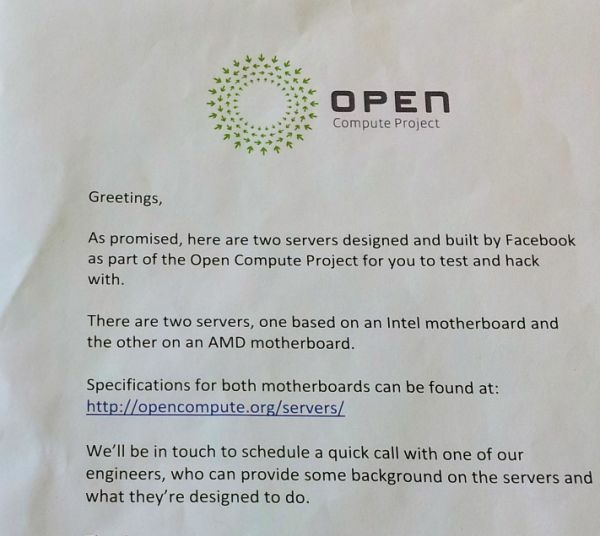 Is a server "targeted at the cloud" and designed by Facebook engineering able to beat one of the best and most popular general purpose servers? That is the question we'll answer in this article. In the middle of the paragraph below the image caption, the sentence reads "...and offers better slightly better performance..."
It's a little difficult to look at a comment about Facebook being a toy application and take it seriously. Yes, Facebook is not directly processing bank transactions on a Tandem, but their site is used to conduct business -- and is even the basis for many businesses, all over the world. Zynga, the company that makes a few annoying games for Facebook, is worth $15 -- more than Electronic Arts. Nearly every major online publisher, including Anandtech, uses their API for content distribution and often as the entire forum system for discussion of publications. The founder is the youngest billionaire in history. Calling theirs a toy application sounds like a Blockbuster customer calling Redbox a toy. It's denial of an obviously successful, large, powerful, innovative company because they don't do things "the old way." I suspect what matters more is that the business is executing flawlessly, the actual problems with data loss or other non-ACID compliant traditional issues are minimal, and that they are making enough money that Google and Microsoft are feel seriously threatened. This is true but ACID can be over-rated for many workloads. How many pieces of data HAVE to be consistent across the entire cluster to be valid? What about NoSQL with configurable consistency like Cassandra?